Allow me to convince you that mindful tracing is a great tool to use in an art class. Tracing has so many benefits. You probably have used it in your own life and encouraged your children to use it also. After all, this is how most children learn to write their letters. It’s step one. Eventually you end up with a muscle memory that allows you to write short simple words without even thinking about each letter. This is often the way we teach children to draw basic shapes. 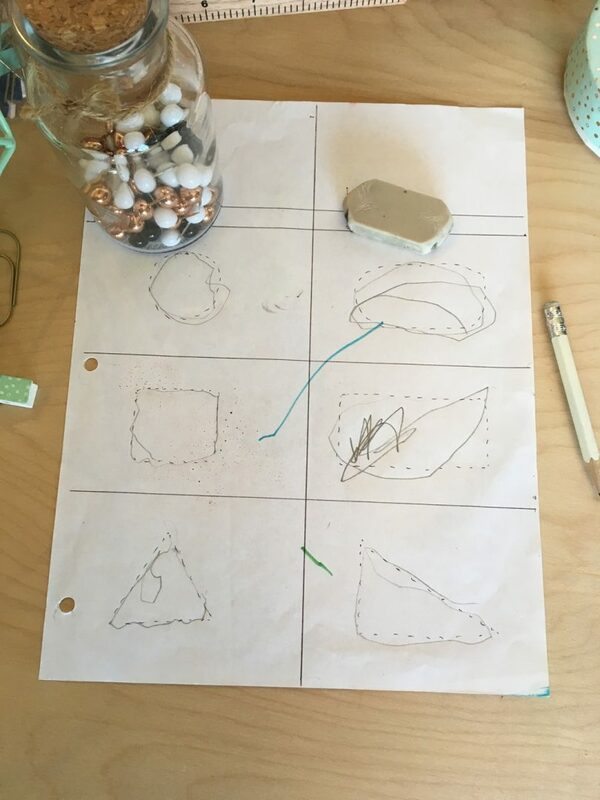 Can’t you picture all those preschool worksheets with little dotted-line circles, squares, and triangles? Yes, tracing really should have a place in any basic drawing class. Let me tell you why- but first, let me explain that I am using “mindful tracing” and “tracing” interchangeably. Brain-less tracing has much fewer benefits, so I really won’t address it here. Next week I will go into more detail on HOW to include tracing in an art class. 1. Tracing is a great way to learn to draw. For the vast majority of the population, tracing is a handy bridge that helps us translate what we see in three dimensions, to a two-dimensional drawing. For example, if you asked a student to draw a daisy, their first impulse might be to draw a circle of flat tear-drop shaped petals, because that’s how they’re accustomed to thinking about flowers. However, if I were to photograph the flower, print it in black and white and have the student trace the lines of the petals, he would notice that the petals are not all laying flat. They overlap, bend, fold and curve. Suddenly he would see how a counterintuitive set of lines ends up looking like an actual three-dimensional petal! There are other ways (beyond experimentation) to learn to draw, of course. I could show a class of students, step by step, how to draw a realistic daisy. However, they’d then still need me to teach them when they wanted to learn to draw a rose. Learning to trace an existing drawing or photo actually frees them from needing me! Step-by-step instructions are great, and there is certainly a time and place for them, but they don’t replace the tool of tracing. Mindful tracing can be a temporary teacher as it show students, maybe for the first time, which lines actually curve and which are straight, which lines are at an angle and which are perfectly vertical. Mindful tracing can help them notice what they’re seeing. 3. 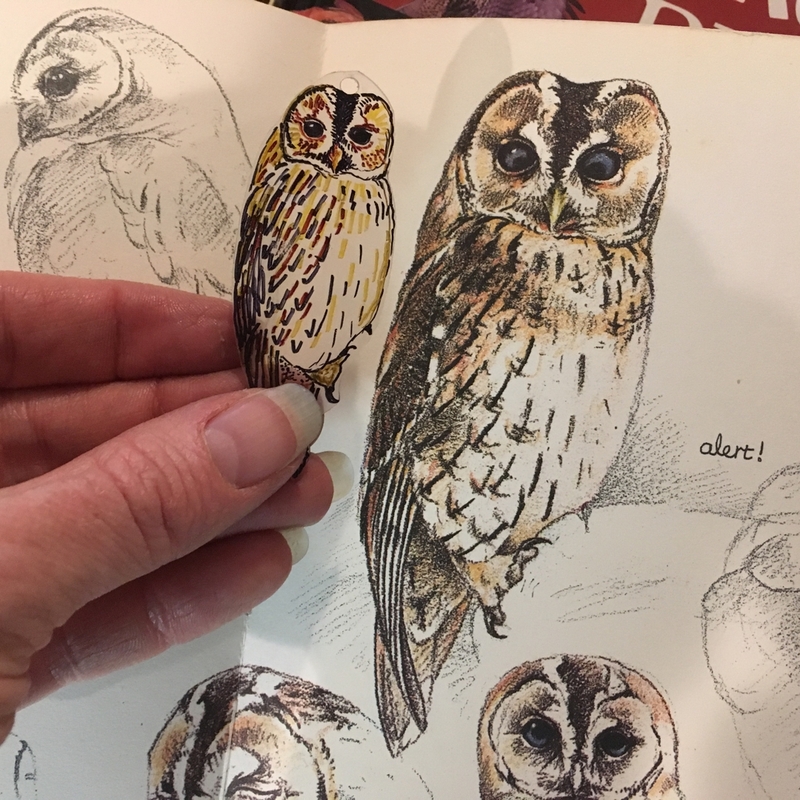 Tracing can help simplify a complicated work of art. 4. Tracing has been shown to improve other skills. There are many interesting articles that show, when children mindfully trace, they improve their visual spatial skills and their fine motor skills, which helps them later with both math and reading! Check out the article, “Can copying and tracing make children smarter?” By Gwen Dewar, Ph.D.. Next, do a google search and be amazed at all the research about how tracing helps the brain retain information and grow! 5. Tracing helps you notice the details. There’s really nothing like tracing an item to make you realize its actual shape. 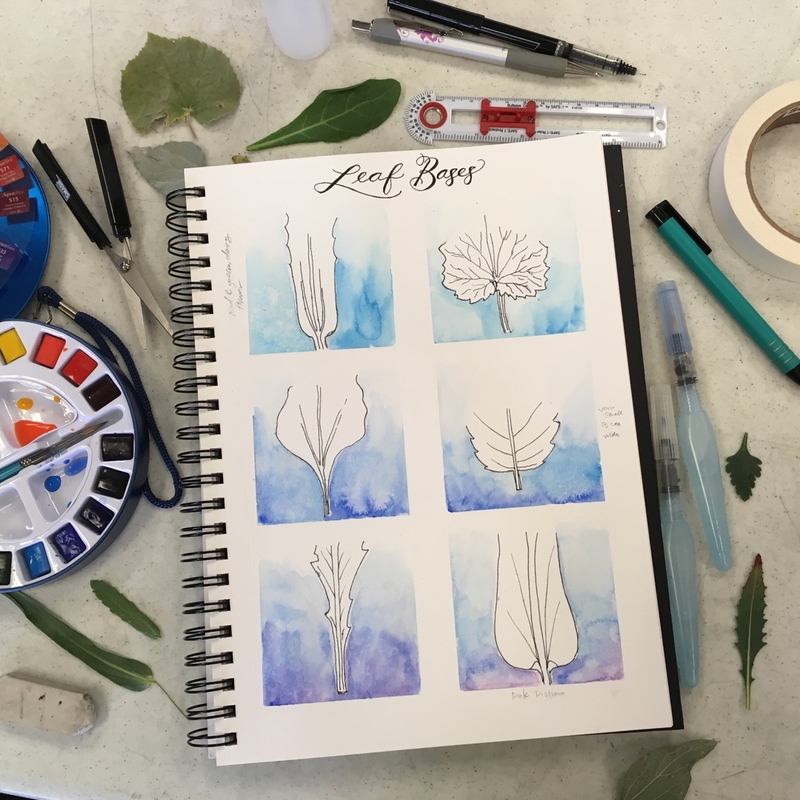 For example, I took a botanical art class where we spent most of a day drawing different parts of assorted leaves. 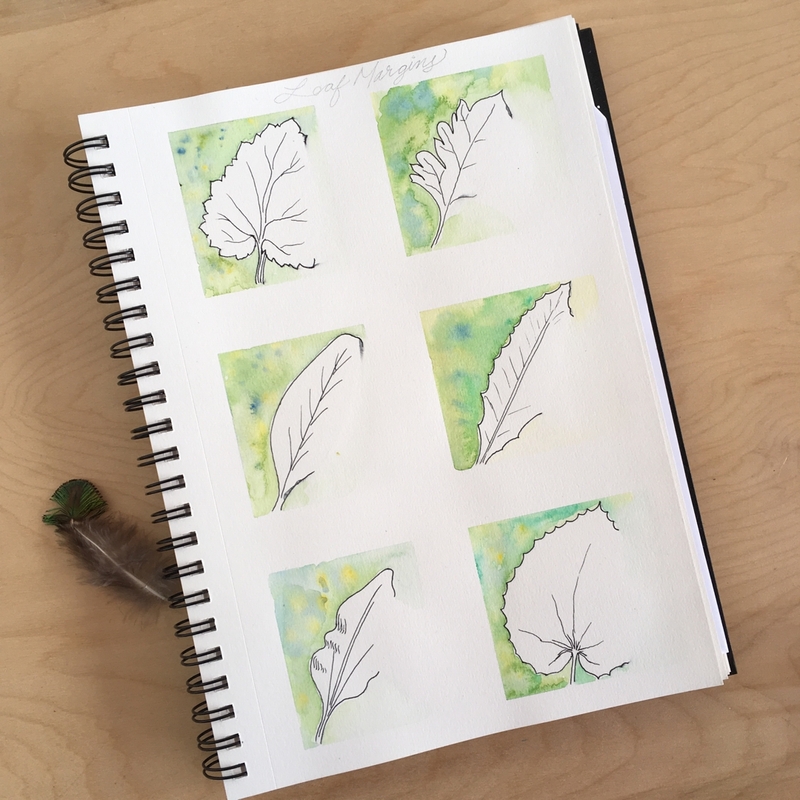 I had never noticed just how much variety there is in leaf bases, edges, apexes, etc, until I set about drawing them! I have a new appreciation for the diversity of leaves. Tracing can do the same thing. There’s nothing more energizing to an art teacher than to see her students really proud about a piece of art they made! But the ‘wins’ students get when they get to incorporate a bit of tracing into their project, doesn’t just help the art teacher keep going. Even more so, it encourages the students to keep trying and practicing- and really, the only way we get better at ANYTHING is practice. Really, it is. If you doubt it, you really must try it! It’s so rewarding to get a quick win when you’re frustrated with a drawing. Often just tracing some of the basic proportions is all a person needs to then be able to fill in the details. Tracing can often provide a little breakthrough when you’re stuck. Most of all, it’s a quick way to make something fun. 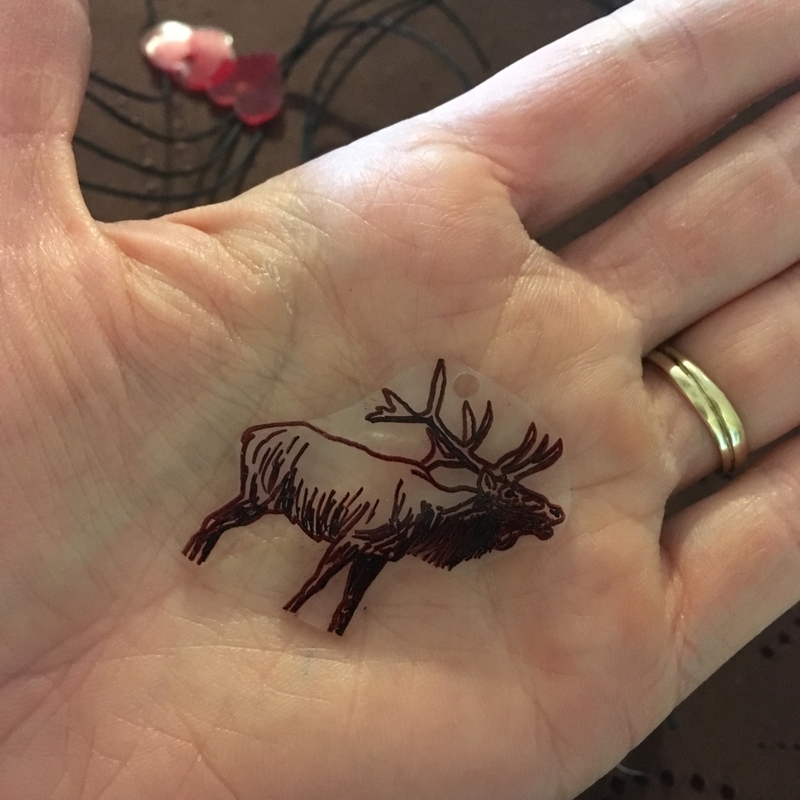 Check out these cute little animals I traced onto #6 plastic and then shrunk in the oven. They make me happy! What are the Objections to Tracing? Here’s the thing, we are all creative. It’s part of being human. Tracing will not stifle creativity. Instead, tracing is a helpful little bridge we use along the way. Eventually, we won’t need the bridge anymore and tracing will be more trouble than it’s worth, so we’ll drop the bridge. Then we’ll have the skills that will enable our creativity to really shine. This is one of the strengths of the classical model of education; When the student builds a solid foundation first, then the expression of their opinions and creativity can be truly beautiful. Tracing is not cheating any more than reading a mathematician’s journal and writing out his steps to understand his calculations would be cheating. This is a tool, a bridge to help us acquire ability to draw what we want to express. In fact, almost everything we learn, we learn from someone else. The discoveries made in a culture would almost never have been possible without the work of those who have gone before us. Any time we learn from those who have gone before us, we’re standing on the shoulders of giants. This is how we advance as a society. *sigh* Who gets to decide what’s really art? If I express my love of orchids with a tracing of an orchid, does that make it any less of an expression of love? What if I artful compose a photograph of the orchid and then trace that? Now it’s an original, creative, sketch to show my love of orchids. People may be less impressed with my skill as an artist knowing I traced a photo to end up with my drawing, but are they any less impressed with the beauty of the orchid? 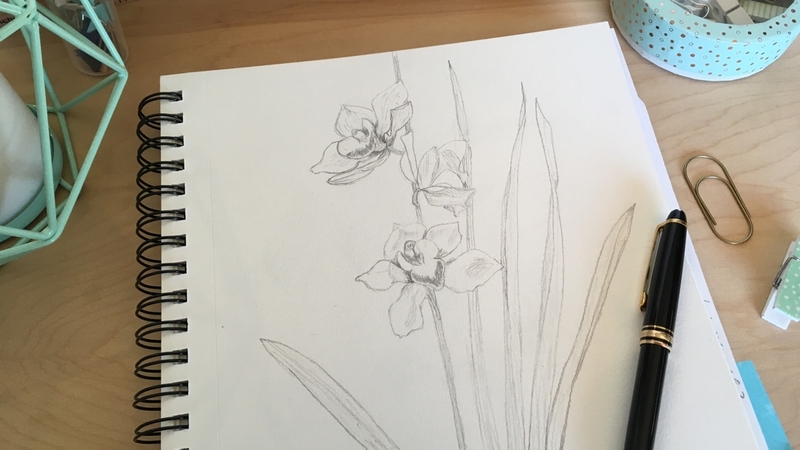 Let’s take it one step further- What if I traced orchids for a few weeks, getting to know their every curve and then was able to free–hand draw an orchid. Does how I acquired the ability to draw the orchid change the meaning or value of the art? These are good questions to ponder. In case you’re curious, I used a great technique called “air tracing” to draw this orchid. I’ll tell you more about that next week. But for today, does the fact that I didn’t do any traditional tracing here make the art more valuable? What do I say to the skeptics? Drawing is a skill we can all learn. 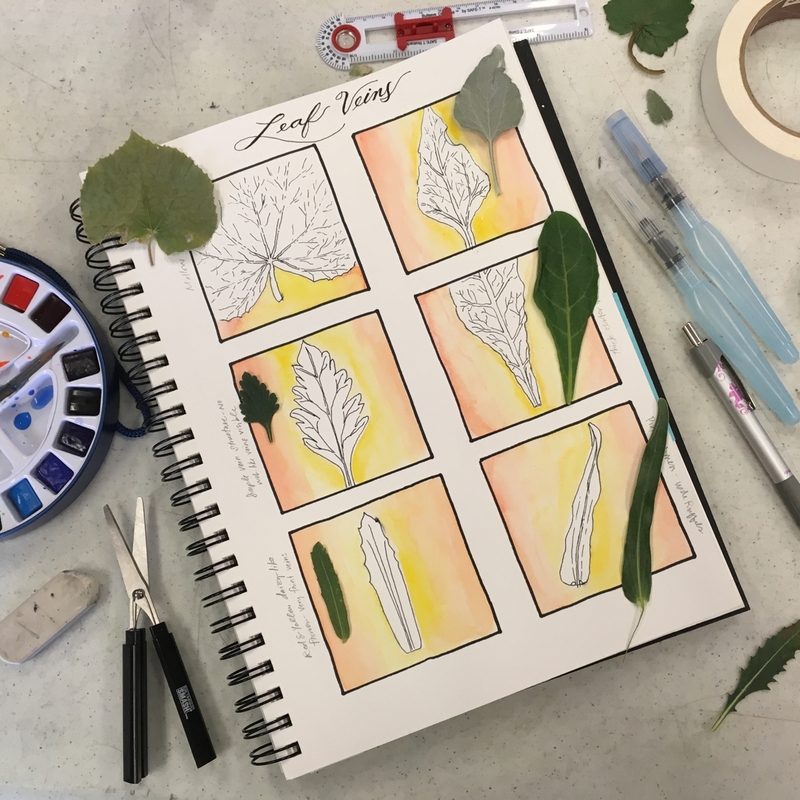 Tracing is one of the many important tools to use when teaching art. Have I convinced you? Are you ready to try it? Next week, I’ll go into detail about how & when to incorporate tracing. 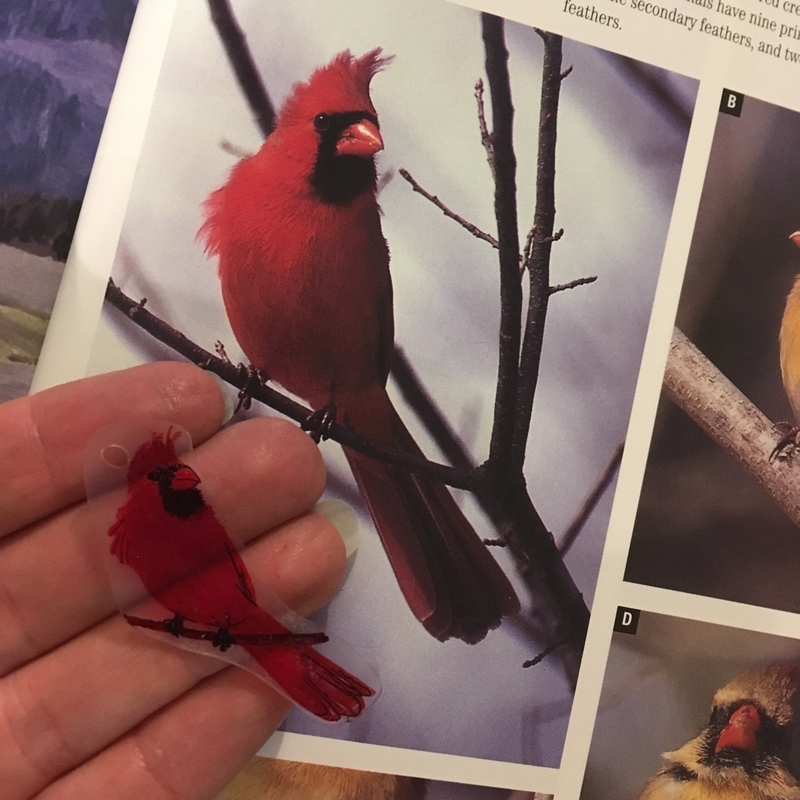 The following week I’ll show you six methods of tracing you can use at home or in the classroom.